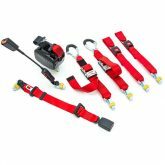 The four point webbing restraint system and occupant restraint is a simple yet effective method to secure wheelchairs during transport. 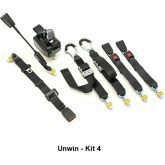 Unwin recommends the use of a three point occupant restraint system to provide greater protection in case of an impact. This system is not ISO 10542 compliant if used in two -point configuration.